CBO and JCT estimate that the insurance coverage provisions of the ACA will increase the proportion of the nonelderly population with insurance from roughly 80 percent in the absence of the ACA to about 84 percent in 2014 and to about 89 percent in 2016 and beyond (see Table 2). CBO and JCT project that 12 million more nonelderly people will have health insurance in 2014 than would have had it in the absence of the ACA. They also project that 19 million more people will be insured in 2015, 25 million more will be insured in 2016, and 26 million more will be insured each year from 2017through 2024 than would have been the case without the ACA. Projections for the cost of the Affordable Care Act have been reduced due to a combination of factors including less money being spent on subsidies than projected. The report also found that premiums are lower than expected and the CBO does not project a significant increase in premiums in 2015. They project that premiums will increase by about $100 for silver plans in 2015 and subsequently project annual increases of 6 percent per year. There have often been double digit increases in premiums in the individual market in the past. One reason for premiums being lower than previously projected by the CBO is that more people are purchasing plans with greater restrictions than the CBO had previously predicted. For the benefit of the vast majority of the country who, despite all the attention the topic has received only represent a small percentage of the entire country, here is a brief explanation of the choices available. Plans offered differ based upon how high the deductible and co-pays are, with those having lower out of pocket expenses having higher premiums. Some insurance companies also offer different plans in each category which differ based upon how restrictive they are. For example, I had the choice of a few Blue Cross plans. The most expensive (which I purchased) offers access to all physicians who accept Blue Cross and is the traditional non-HMO insurance plan. There were also less expensive plans offered which correspond with the HMO products they have available. They cost less but also restrict which doctors can be seen, and typically pay out less. The least expensive option was a new plan which, while sold under the Blue Cross name, is actually run by a local hospital network and (with some exceptions) restricts coverage to doctors and hospitals in their network. In the past, employers have had comparable choices to offer to their employees. There has been a push back as many people have been unhappy with the restrictions from HMO’s . While some employers have continued to offer more restrictive HMO plans, many others have changed to more expensive but less restrictive plans. 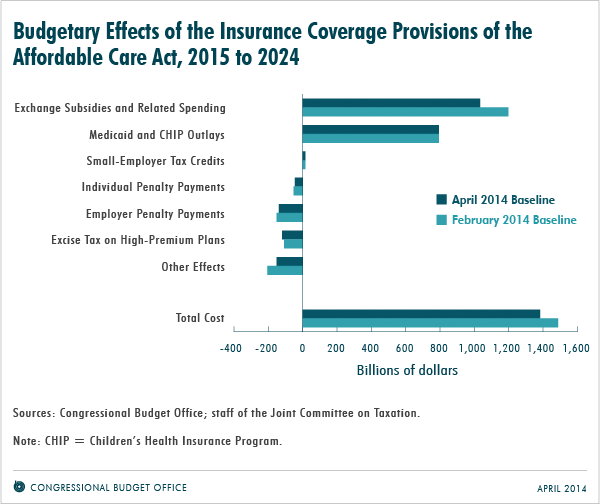 The CBO originally projected that insurance purchased through the exchange would mirror the employer plans. I do not find it all surprising that instead there were greater sales of the more restrictive plans. Those new to insurance coverage would not have had bad experiences with restrictive HMO’s. Many people who were denied insurance in the past were happy to have any coverage. As they were paying out of their own pocket, even if receiving subsidies, it is also to be expected that consumers would purchase the less expensive HMO plans unless they have experienced reasons to purchase the more expensive and less restrictive plans. Some see this as evidence that the Affordable Care Act has been more successful then it actually has been in cutting expenses. It is likely that over time there will be more people who will choose a plan without the HMO restrictions. The CBO does predict that “the differences between employment based plans and exchange plans will narrow as exchange enrollment increases. That pattern will put upward pressure on exchange premiums over the next couple of years, although CBO and JCT anticipate that the plans’ characteristics will stabilize after 2016.” Again, their projections are for a 6 percent annual increase, which still remains less than has often been seen in the past. This includes increases due to expected consumer demands for less restrictive policies but the CBO is not able to code potential decreases in costs from future improvements in cost control, leaving hope that the increases might be less than this.